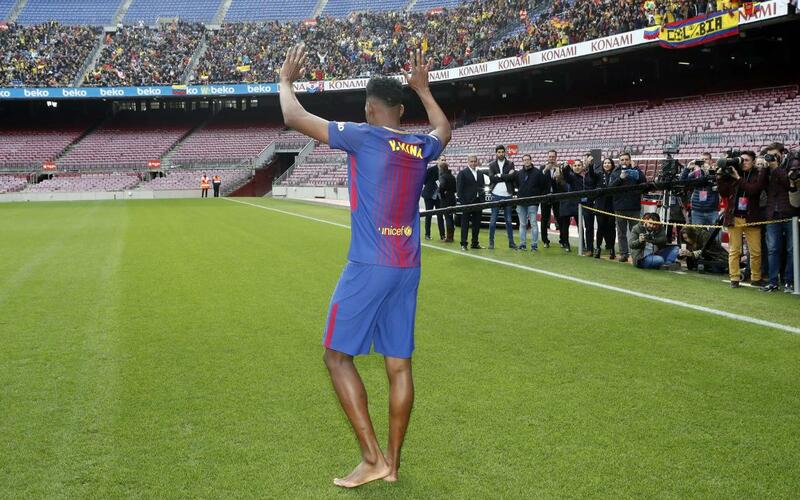 Yerry Mina surprised everyone at his official presentation with FC Barcelona when he took his first steps onto the Camp Nou pitch barefoot. Superstitions in the football world are common of course, and this one was also a symbol of respect for his new team. Mina gave a reason why he did it at his press conference afterwards, explaining his belief in one of the proverbs of the Bible he uses. “’With the plant of your feet you will touch the terrain you want to conquer.’ And I want to succeed here,” he acknowledged. Throughout the presentation, Mina showed signs of his extroverted character. He fully enjoyed the day, from the signing of his contract in the morning, to when he stepped out in front of thousands of supporters at the Camp Nou. They also witnessed one of the Colombian's funniest facets; his dancing. Without a doubt, it was a presentation that left everyone with a smile on their face.